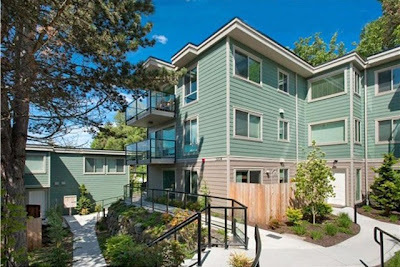 When we first were contacted by this buyer, he wasn’t quite sure where he wanted to live but he knew he wanted to move closer to work in Downtown Seattle and buy his first place. The first step is always a Buyer Consultation. It is when we sit down with our clients, go over the process and the ins and outs of buying, and answer any questions they might have. This can be a long meeting depending on the clients comfort level. This buyer had great in depth questions that showed a real desire to fully understand the intricate process. Once he felt comfortable moving forward, we hit the town in search of the perfect place. From Bellevue to Seattle to Mercer Island we checked out the potential condos. Mercer Island won the battle. Close to Downtown but quiet and neighborhood feeling for a relaxing living experience. A condo was located, the offer accepted but when the buildings financials were delved into a picture of a slightly under funded building surfaced. We coached our client through the documents included in a condo Public Offering Statement and what he found was that it wasn’t a fit for him. So we moved on and found the perfect condo, in a great healthy building and the perfect location!